My boyfriend and I took the Bolt bus from Portland up to Seattle to celebrate 4 fun years together. Before leaving, we discussed our expectations for the trip (because that’s what you do after 4 years together). Would we A: Spend the weekend visiting museums if the weather’s dreary? B: Visit shops and eateries and walk around Pike Place Market like we usually do? C: Lounge around like walruses in the Airbnb loft? Or D: Bird, bird, bird, because birds! We compromised with E: Most of the above. My boyfriend shares my love of nature and adventure, yet he doesn’t quite share the same enthusiasm for birding (understandable). He would prefer to sit, observe, and journal about or illustrate nature around him – which I totally admire because I can’t draw worth a twig. The weather cooperated, so outdoors we went. We first stopped at the Seattle Audubon Society for local birding recommendations. From there we traveled to Warren G. Magnusun Park Seattle’s second largest park, rich with military history….also, rich with birds. A whole mess of Scaup! The best part, the bird wasn’t spooked by our presence so we were lucky enough to spend time observing and taking a variety of pictures. Even with such close proximity and crystal clear identifying features, my inexperience prevented a confident species call. 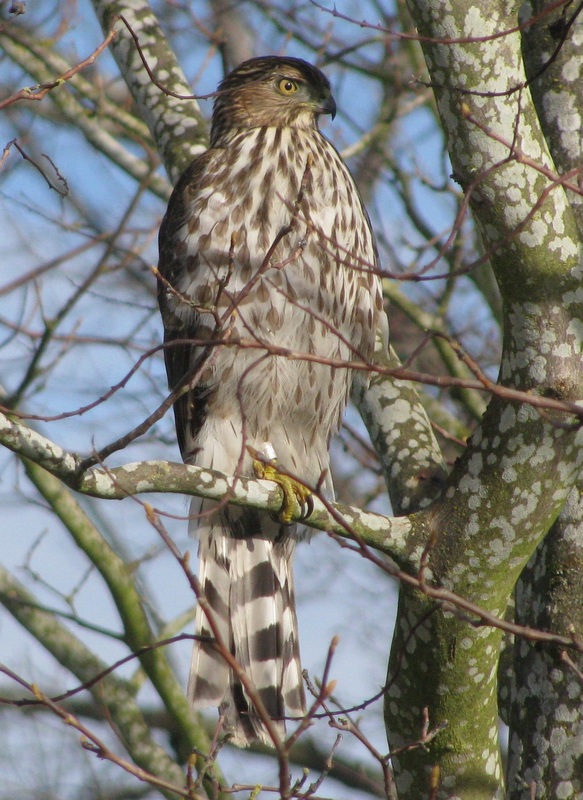 I narrowed it down to an Accipiter genus, the banded tail, the smaller size, the streaks on the belly….in my mind it was either Cooper’s, Sharp-shinned, or Goshawk. The pictures in Sybley field guide told me this was a juvenile. I took a few dozen pictures to study and confirmed once home using WhatBird, it is in fact a juvenile Cooper’s Hawk. I’ve yet to see a Sharp-shinned Hawk, but I believe they are smaller, with a less defined neck. The Goshawk has a more defined light “eye-brow.” Not a new species (I’ve seen one adult Cooper’s Hawk during the X-mas count), but still a cool sighting! Before birding I wouldn’t have sought out parks on a trip like this. It is a fun new perspective and a refreshing way to look at the city. I look forward to the next trip. Hah! The inspiration to find that joke came from an incidental bird sighting on Monday. 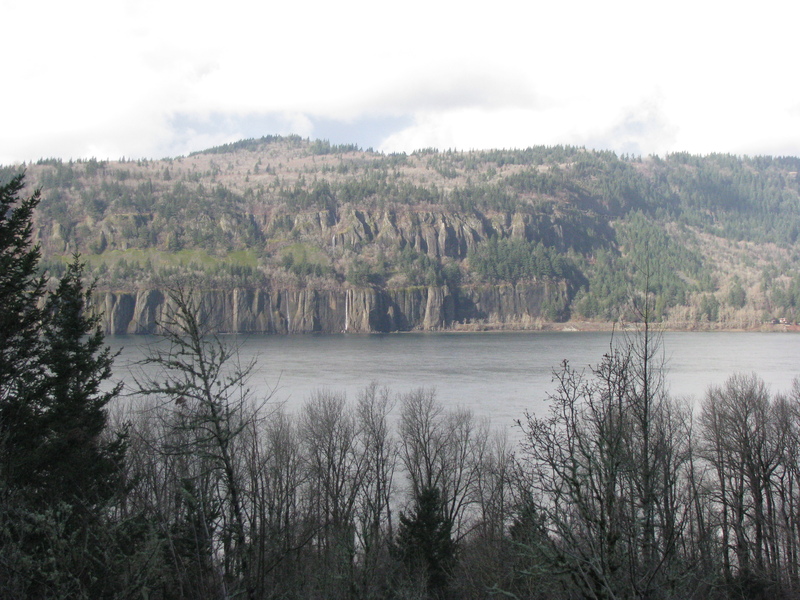 Along with a team of 30+ people volunteering for the Lower Columbia Estuary Partnership I spent the morning at Benson State Park in the Columbia Gorge planting ninebark, snowberry, and salmonberry along Wahkeena Creek to improve salmon habitat. 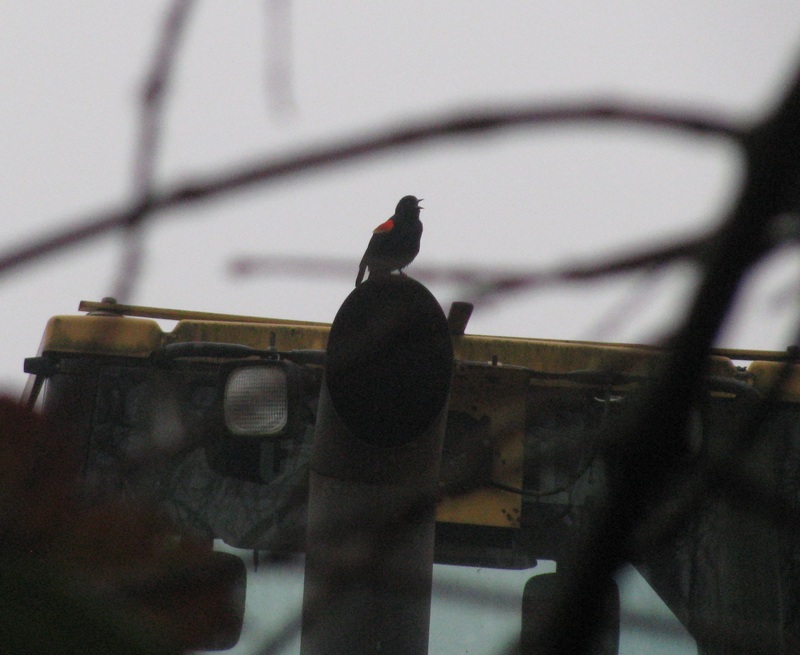 Not specifically intending to bird that day, after planting I heard a fast wuk wuk wuk call that sounded very woodpecker-like and I thought, maybe a Northern Flicker? But no, this bird was bigger, and had a very distinctly shaped head. I couldn’t help but investigate further. It was a nice surprise when I finally got a good look at the Pileated Woodpecker! This striking bird is the largest woodpecker in North America.